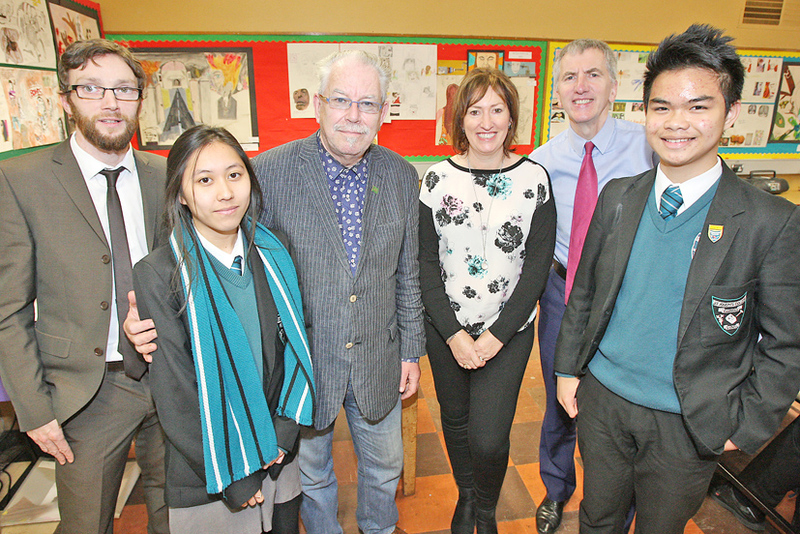 IRELAND’S leading visual artist, Robert Ballagh, best-known for designing coins and banknotes and devising the Riverdance set, visited St Joseph’s College on the Ravenhill Road to meet senior Art students. The Dubliner also viewed work by A-Level students at the school and had warm words of praise for the high quality of the art they’re producing. St Joseph’s Art teacher Barry McCarroll said he was delighted to have Robert Ballagh share his work with the pupils and was sure they would gain inspiration from his presentation. South Belfast MLA Máirtín Ó Muilleoir, who facilitated the visit, said he was impressed by the dedication and knowledge of the junior artists. “I saw young people who were keen to succeed and to learn and I wish all the students sitting GCSE and A-Level Art exams in St Joseph’s every success next year,” said Máirtín.